Picture your wedding morning… You’re sat in a beautiful room sipping on a glass of bubbles whilst your talented hair and make-up artists transform you into a total wedding goddess. Your maids are excitedly fluttering around. Your beautiful gown is draping down over the four poster bed, and there’s a real, tangible air of beauty in the room. You are just glowing with happiness. Sounds amaze right? Now imagine your photographer taking pictures of all the beautiful proceedings. What are you wearing? Your tea stained m & s bath robe? Oh no, no, no. That just will not do. These pictures are going to be around FOREVER!! Now re-imagine the scene. You are wearing the beautiful silk kimono pictured above by Violet & Wren. Better? You’ve started to breath again? Good. Well what would you say if I said you can WIN that beautiful Kimono and pair of matching knickers, in either the Magnolia Glow or Glasshouse Palm Print? You’d be super excited right? Well my lovelies, this is YOUR CHANCE TO WIN this beautiful piece of luxurious loungewear; taking you not only through the morning of your wedding day, but beyond… to your honeymoon and all those special occasions. This generous prize is worth a whopping £405! So enjoy swooning over the beautiful Violet & Wren luxe loungewear collection and then get entering. 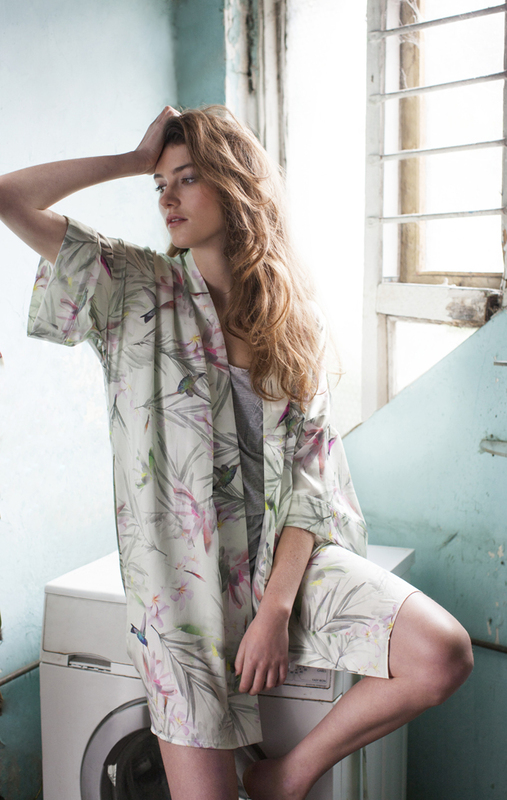 Recently launched, luxury printed, loungewear brand Violet & Wren introduced their debut collection entitled ‘Botanica’. A fresh mix of intoxicating prints, butter soft silks and luxe sports silhouettes are brought to you by this proudly British brand. The brand was born from the collaboration between artisan botanical paintings and the most detailed design and pattern cutting. ‘Our design philosophy concentrates on the concept of beautiful and directional, silk loungewear pieces that marry a fresh and modern silhouette with beautiful, hand rendered botanical prints in clean and crisp colours. Our collection champions the trend for 24 hour dressing, with a transition from the intimacy of ‘home’ to styling with your high waist denim, everyday tees and cashmere knitwear, offering a more directional and refreshing approach to luxury loungewear. Luxe, sports inspired silhouettes give a youthful, directional attitude to the collection with the items being sold as separates, enabling a mix and match approach’. ‘From lace racer backs, cropped lengths, immaculate narrow binds and a nonchalant, relaxed fit, we offer a proposition that marries youthful silhouettes, bold and beautiful prints and feminine detailing. We purposefully designed the proportions a little more cropped, fluted and fun to counter the classic product type’. ‘All of the garments are proudly made in England collaborating with expert manufacturers and supporting British industry. We invite you to explore the delicate “magnolia glow”, fresh and exotic “glasshouse palm” and the dark and romantic “lacquered rose”, complimented by the beautiful plain “violet haze”’. Violet & Wren co-founders Helen and Louise believe in beautiful, crafted investment pieces rather than fast, turnaround fashion. They design and manufacture their products in England and support UK crafts and workmanship. To enter please leave a comment in the comments section below describing your wedding day. I wanna hear all those yummy details!! 1. The Promotional Prize for winning The Giveaway shall be either a Magnolia Glow or Glasshouse Palm Print Eden Kimono and pair of Florence knickers from Violet and Wren Ltd , valued at £405.00 (the “Prize”). 2. The Promotional Prize will be made to order (unless stock is available) for The Giveaway winner after the winner has provided Violet and Wren with their sizing requirements and valid mailing address and proof of identity. If the prize is made to order the lead time for receiving this product may be up to 60 days. 3. The Prize is neither transferable nor exchangeable and cannot be exchanged for money or money’s worth. 4. The winning entrant shall be solely responsible for any taxes levied in relation to the delivery or receipt of the Promotional Prize. Please note that all shipments outside the UK may be subject to import duties and taxes, which we have no control over and are levied once a shipment reaches your country. As the customer and importer of the goods, you will be responsible for these charges. Import duties or tax costs will be invoiced to you directly from the appointed forwarder. We recommend you contact your local customs authority to determine a landed cost price prior to purchase completion. Violet & Wren is not responsible for any delays on goods that have been held back as a result of procedures carried out by your local customs authorities. 5. Violet and Wren will deliver the prize to the winning applicant using Royal Mail special delivery in the UK or FedEx in the USA but cannot be held responsible for damage, loss or delay once the item has been shipped. 6. Violet & Wren Ltd has taken great care to ensure that colours and products are displayed as close to the true product as possible. However variations of screen colour may occur and we cannot 100% guarantee the colour on your monitor is a true reflection of our product on delivery. All of our product should be hand-washed, or dry cleaned as per the garment care instructions. We do not accept any responsibility to wear and tear and damage to the product caused by machine washing. My hubby and I are flying out to St Lucia after 12 years together. We are childhood sweethearts. My mother won’t fly so we have come to the decision that the ceremony will just be the two of us. I think this symbolises our untidy together, dependence on each other to the exclusivity of everyone else. We will marry on the beach at sunset, with no shoes and the sand between our toes. Me in a Hollywood glam style gown, him in a crisp white shirt and simple suit bottoms. We cannot miss the family out altogether. They will watch from my mothers living room back in the uk, my baby bulldog in a tutu at the front acting as our bridesmaid. My mum and sister in their hats (probably also wearing their pjs as we won’t be able to tell) and my dad walking me down the virtual aisle. Bliss. Haha what a wedding Laura!! You must keep an eye on the blog as Chris and I just came back from the Caribbean after renewing our vows :)) it was amazing! You are entry number 2 btw and a winner will be chosen at random using random.org. I wish you the BEST of luck and an amazing wedding day. It hasnt been planned yet but already planning on a honeymoon to the maldives for sure, its heavenly! thanks for such a fab comp! We are going to get married on the beach somewhere . We are going ask a few people from our hotel to come to our wedding . A simple affair…village church followed by a shindig in the village hall over the road. However, we’re adding a touch of festival fun in the grounds. Festival food traders and live music……Oh and gallons of real ale. Our wedding is going to be held on a wine farm in Cape Town, South Africa with views of Table Mountain and the bay from the reception venue. It is going to be a day filled with lots of love and happiness with people coming from all over the world to celebrate with us. Fingers crossed for a perfect sunset for photos! We can’t wait! Our wedding is going to be a casual and relaxed affair… the morning will start with my girls and a private yoga class. I want to LAND in the day and be present fully. Then it will be all go go go getting me and my bridesmaids ready! We’re getting married in our local town hall with our families and friends there to witness our commitment to each other. After this we are all hopping aboard a London red bus to take us to The BBC in Balham, London where we will dance and laugh and cry happy tears (well mostly me!) and CELEBRATE till the early hours. All I really want from my day is to be present and love every moment… it will be perfect every which way! I am getting married in Santorini in Greece with 35 guests we wanted a chilled out laid back affair rather then 100 of people at my wedding and then having wedding party when we back in UK. We are getting married on top of a winery overlooking the caldera sea it’s breath taking then ceremony is in a restaraunt on top of a cliff with stunning views.